Having problems with poor soil? Think you can’t get into organic farming because of your poor sandy soil? Your soil can be improved and it will reward you in the years to come because your plants will grow healthily and rapidly. With their roots planted in healthy soil, your plants will be more vigorous and more productive. There are three types of soil: sandy, clay, and silty. Sandy soil is composed of large, irregularly shaped bits of rock. There are large air spaces between the sand particles that allow the water to drain very quickly. Nutrients tend to drain away with water. Clay soil has particles that are small and flat. There is hardly any space left between the particles because they are packed tightly together. 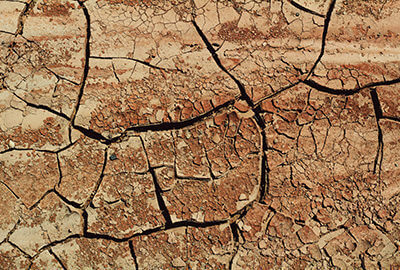 When clay soils are wet, they are sticky and practically unworkable. They drain slowly but when they dry out, they can become hard and cloudy, and the surface cracks into flat plates. Silty soil has small irregularly shaped particles of weathered rock. They are usually quite dense and have small pore spaces and poor drainage. They tend to be more fertile than either sandy or clay soils. That’s the first step you need to take, which is to define the type of soil you have in your garden or farm. After identifying the type of soil, you can then make adjustments. To improve sandy soil, you need to work three to four inches of organic matter in your soil. You need to add at least two inches of organic matter each year and grow cover crops or green manures. To improve clay soil, work in two to three inches of organic matter into the surface of the soil. Add one more inch each year after that. If possible, add the organic matter during fall. You can also use permanent raise beds to improve drainage and keep foot traffic out of the growing area. Make sure to minimize tilling and spading. Improving silty soil is also quite simple. You need to add at least one inch of organic matter each year and concentrate on the top few inches of soil to avoid crusting. You can avoid soil compaction by avoiding unnecessary tilling and walking on the garden beds. Speaking of it, you might want to consider constructing raised beds. These simple steps should transform your soil into healthy ones that are perfect for organic farms and gardens.